This tutorial also works on Bunsenlabs Helium. So I thought I'd simplify it and post it here. All credit to the original author. Using gparted or any other hdd application, create a new partition table (msdos, and not gpt) on your external device. a) 1.5GB fat32 partition with any label (I am using 'XFCE' for this post) and check the 'boot' flag. b) An ext4 file system of the remaining space with label 'persistence', ignoring the quotes. Click on both partitions in file explorer to mount it or remove the USB and plug it back in. Change the mount point of the partitions, your actual username instead of username, iso location and device ids (sdX) in the below code according to your system's and execute the code one at a time. If you wish to execute the entire code in one command, make necessary changes and use the below code. When executing in a single command, if you come across an error, the error message might help you identify the command which prompted the error. Eg, install-mbr: Failed to open /dev/sdc: Permission denied is associated with the command /sbin/install-mbr /dev/sdc. In such a case, fix the issue and re-execute that particular code along with the rest of the code. Once boot into the live system, it is a general ritual to update and upgrade the packages. There is a good possibility that your wifi will be frustratingly slow after you have upgraded the packages. 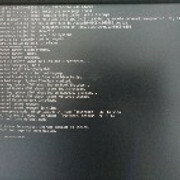 This is because of the package linux-image-4.9.0-6-amd64 that is upgraded during the previous process. Do apt list --upgradable before upgrading and you can find this package. Save the config file and reboot the system. Hello. Followed the tutorial, but could not get persistence. USB booted, but no persistence. I still think there's an easier way to install BL with persistence. Use virtualbox, and expose the USB drive to the VM. Treat the USB drive like the target install disk. Don't install any VirtualBox additions. Once you've installed everything, shut down the VM and reboot your computer, booting from the USB drive. You'll now be in a fully installed, persistent BL. The only caveat here is to pay attention when configuring your VM to use EFI when appropriate, otherwise you'll have a borked bootloader. Update. I've ran again with the tutorial and successfully created persistence live usb. Guess it msdos filesystem was mandatory, I used gpt. Also I missed chown step. Anyways, explanation of the steps would be nice to see. Glad it did. The explanation to most of the steps are in the original tutorial (the first link of the post). Hence ignored the steps and choose a step by step instruction. I have also added the step of creating a new msdos partition table on the device. During the original post I presumed that user would do it. There's also a tutorial on creating UEFI live usb with persistence. Does that mean that there are to EFI partitions and two live partitions? What for? There's no explanation to this in the tutorial. As well as to the sizing. We need an EFI boot partition for UEFI PCs to boot from the USB drive. Then we need a sufficiently large partition to hold the original live ISO filesystem image contents. That partition must have the legacy_boot flag set. Then we add the persistence partition, using up all the remaining space of the USB drive. You can do that with any GPT capable partitioning tool (mind the legacy_boot flag). Therefore the lines you quoted does not create two EFI partitions and two live partitions. parted /dev/sdX --script mkpart live fat16 10MiB 3GiB - This creates a second partition to hold the live image from 10thMB to 3rdGB of the disk's. parted /dev/sdX --script mkpart persistence ext4 3GiB 100% - This creates the persistent partition from 3rdGB to the rest of the size (100%). Thanx for explanation So 10MB is enough for EFI? Mostly 100MB is the recomended minimum, some use even 512MB. In all honestly, I am not sure of that. I guess someone with better expertise can shed some light on it. Well, not a big deal anywayz. With today drives space is not a problem. Did 100MB for EFI, 1.5GB for live and the rest for persistent. 64GB uefi persistent flash drive was successfully created and booted. That's nice to know. I should try that tutorial as well. It should work, perhaps some codes are executed with a typo. Please make sure that your mount points are correct and your username is correct too. Please make sure that you're booting to the legacy version (grub will have bunsenlabs logo and options, somewhat like this) and not the UEFI version (Grub background will be blue in color with white font, somewhat like this). If your computer boots to the UEFI version, your OS will not be persistent in any way. Good morning, thanks for the tutorial, but I would like to get persistence even for the installed programs, instead after the restart there are no more. How can it be done? I suggest you open a new thread in 'Help & Support', and give details of what you have done so far. Without further information it would be difficult to give you an answer. The tutorial gives persistence to all aspects, including installed programs, preferences of installed programs and even downloaded files. Update. For UEFI boot there's no need to create EFI partition and install syslinux. Hello, thank you for this tutorial. It tells me "Everything is Ok", but should I be concerned? What does it mean that there are data after the end of archive? install-mbr:/dev/sdb: Probable detection of modern MBR format which is currently incompatible with install-mbr. Installing will probably break Windows installations on this system. Use --force to override.
. Is that going to cause problems? From what I deduce, there seem to be some remnants of previous images of either linux or windows in the USB stick. From my experience, force installing mbr never gave me a problem in such situations. However, the first error is a new thing for me. Whether it works of not, I can't tell it for certain. It's been a couple of days, did you try that USB stick? Did it throw any error? You'll see messages about your drives not mounting to /live/persistence, that's normal. The first time you boot, you'll see a brief cron job running, that's the persistence being configured. It booted fine, but no persistence. Er, rather, it gave me partial persistence one time -- it remembered the alternate conky I selected but it didn't remember the alternate background I selected -- but on subsequent reboots it didn't even retain the partial persistence. I've been noticing on shutdowns it says it fails to unmount the persistence partition, maybe that's the problem. FWIW I also tried a different USB stick using the above post's steps (which were virtually the same as yours anyway), and no persistence that way either. Not super important. I've been having to wait a few days for my replacement SSD and thought it would be nice to have some persistence while I wait, but it will be delivered tonight and I'll be back to an installation on my machine.